What happens when a weekend athlete - of average skill at best - joins the professional golf circuit? George Plimpton, who had earlier tried out for the Detroit Lions of the National Football League (in Paper Lion) and got a chance to pitch to a team of major-league all-stars in Yankee Stadium (in Out of My League), spent a month of self-imposed torture on the tour -- meeting amateurs, pros, caddies, officials fans, and hangers-on. 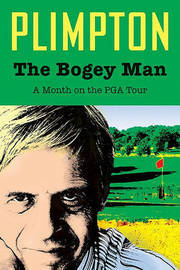 In The Bogey Man we find golf legends, adventurers, stroke-saving theories, superstitions, and other golfing lore, and best of all, Plimpton's thoughts and experiences -- frustrating, humbling, and, sometimes, thrilling -- from the first tee to the last green. This intriguing classic, which remains one of the wittiest books ever written on golf, features Arnold Palmer, Dow Finsterwald, Walter Hagan, and many other golf greats and eccentrics, all doing what they do best. George Plimpton (1927-2003) was the best-selling author and editor of nearly thirty books, as well as the cofounder, publisher, and editor of the Paris Review. He wrote regularly for such magazines as Sports Illustrated and Esquire, and he appeared numerous times in films and on television.